The 7th Hussars made some concessions to the sub-zero temperatures during their time in Canada in 1838-42. 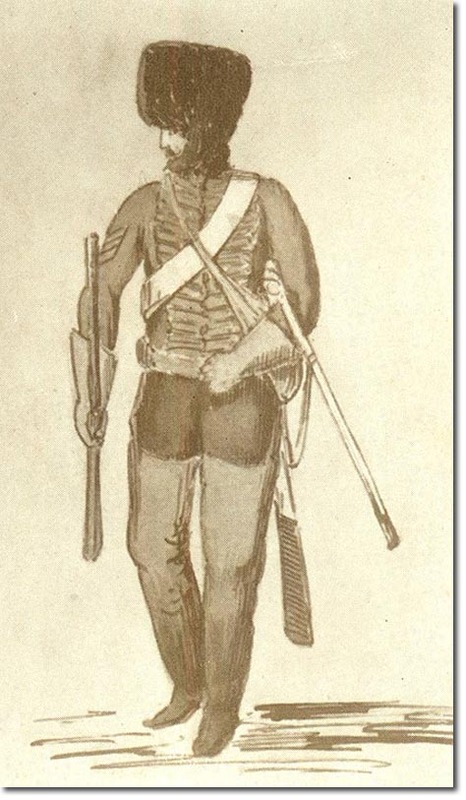 This sergeant wears his red pelisse over his jacket with his blue trousers covered by brown fur-lined thigh boots. His shako was replaced by a warmer, fuller version of the Hussar busby and we can just see the red bag which falls on the right side. He has warm gauntlet gloves and is armed with a carbine and sword. His sabretache hangs from his waist on the left side. Beards were allowed at this time. The painting was made by Sir James Archibald Hope in c1838. It formed the basis for Pierre Turner's colour illustration in our Uniforms section.